When we remove your braces, the retention phase of your treatment begins. It is surprising to some that the retention phase lasts a lifetime. Teeth as indeed the rest of our bodies, will inevitably change. Once your teeth are straight it is necessary to maintain their alignment over a lifetime with retainers. Your final orthodontic result depends on your retainers, so be sure to follow through with the hard work you’ve put in so far. The aligner retainer, also known as an Essix or Invisitain Retainer is a transparent removable retainer that fits over the entire arch of teeth. They can also be used at the end of treatment to achieve minor tooth movement and help reduce the time in braces. They are especially effective as an upper retainer. Recent improvements in aligner theraphy, such as Invisalign and SureSmile Aligners, have made it possible to correct post orthodontic movements which may have occurred. Bonded lingual retainers are cemented directly to the inside surface of your teeth. This is one of the best ways to prevent your lower teeth from shifting as it is permanently attached! Patients with bonded lingual retainers should be careful with how they bite, as the bonding material may break and cause teeth to shift quickly. As with removable retainers, it is important to keep them clean. When brushing, make sure to carefully clean the inside of your lower teeth as well as the wire. Bonded Lingual Retainers do not prevent all types of post orthodontic movement. 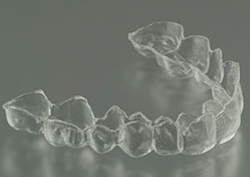 It may be necessary for some patients to use an aligner style retainer in addition to the fixed retainer. While fixed upper retainers are becoming increasingly more common, they do present problems that may make them unsuitable for all patients. Deep bites, patients who grind their teeth and poor oral hygiene are just a few reasons that a fixed upper retainer may not work for a patient. Upper fixed retainer are more vulnerable to breakage and may need to be replaced more frequently than the lower fixed retainer. Patients who grind their teeth at night are particularly susceptible to breaking these retainers. Upper retainer are not advisable if a patient has difficulty maintaining healthy gum tissue. It is recommended that patients see their Dental Hygienist at least twice a year. If your retainer breaks, call us immediately to schedule an emergency appointment.